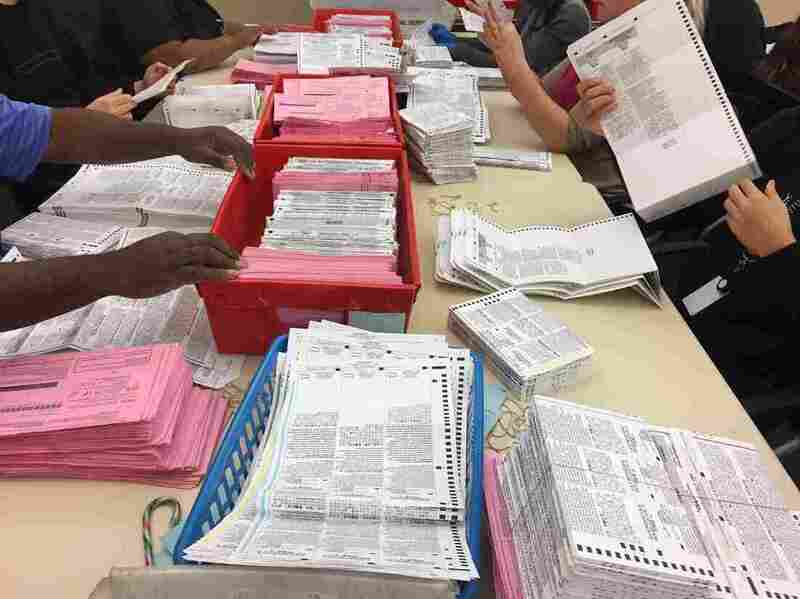 Election workers sort through unprocessed vote-by-mail ballots at the Sacramento County Registrar of Voters office on Monday. So why does it take California so long to count the votes? Well, for one thing, blame coffee. "Coffee stains look just like an oval mark," says Sacramento County Assistant Registrar of Voters Alice Jarboe. "So we have to remove all those coffee stains." Yes, it seems at least some Californians like to fill out their vote-by-mail ballots over breakfast. And it gets worse: jam and jelly. "We do find those on the ballot," Jarboe says. "Those gum up our vote counting machines, so we will remake those ballots." Remaking a ballot doesn't happen quickly. Two election workers pair up to copy the votes from the damaged ballot onto an unmarked duplicate. "One person will call, the other person will mark," Jarboe says. "And then they'll double-check their work to make sure that the calling and the marking compares." A nearby election worker calls out "65 yes, 66 yes, 67 no," as she and a colleague compare a ballot's votes on three of California's statewide propositions. After they check their work, a quality control team will check again. And then, the damaged ballot gets a big blue "VOID" stamp. Other times, Jarboe says, there's a slightly quicker fix involving white-out tape: "We will take that white-out tape and white over the problem ovals — the voter crossed out the oval, and said 'No not this one, this one' — we'll cross out the one they didn't want; we'll white that out; and then a star stamp next to it. The star stamp is everybody's indication that we touched that ballot and we corrected it in some way." It's likely that 14 million people will have voted in California once all the ballots are processed — and Clinton won the state by a nearly 2-1 ratio. As voting by mail has surged, so too has the time it takes counties to count ballots. Plus, there are provisional ballots, which take even longer to process, because it's often hard to verify a voter's eligibility. California provisional ballot laws are much more permissive than in other states. "We would prefer that you show up at your own polling place and that you be registered," Jarboe says. "But we're not going to tell you to go away, that you can't vote. We'll go ahead and let you vote a ballot and put it in a provisional envelope, and then we true it up here." "These expansions [of voting rights] end up slowing down the vote count process," says Paul Mitchell, one of California's top voting data analysts. "But to trade off 'we're gonna get our votes counted quicker and disenfranchise people on the front end,' I don't think is the right trade-off." California counties have two more weeks to certify their final ballot counts. Some other large states like Florida and Virginia have already done so. Mitchell says California's slow work is skewing Americans' perceptions of the election results. "The presidential race was a much larger popular vote win for Hillary Clinton than was seen on Election Day or even the couple days after the election," he says. "And that's only going to expand."